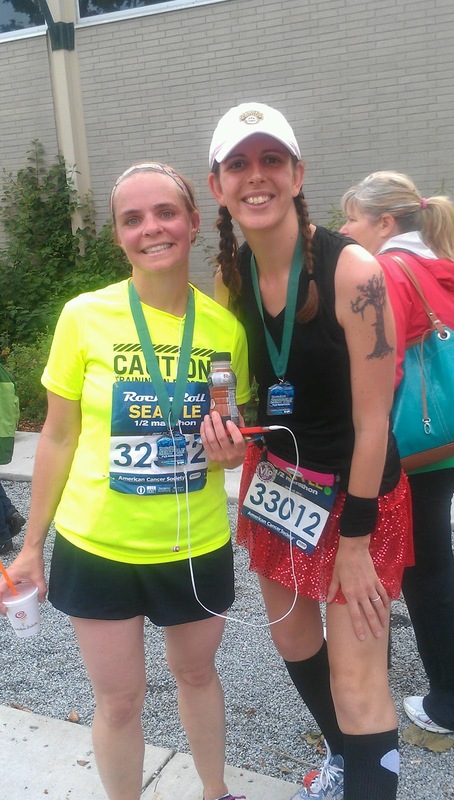 Sybil Runs Things: Seattle Rock-n-Roll Half Marathon race report! 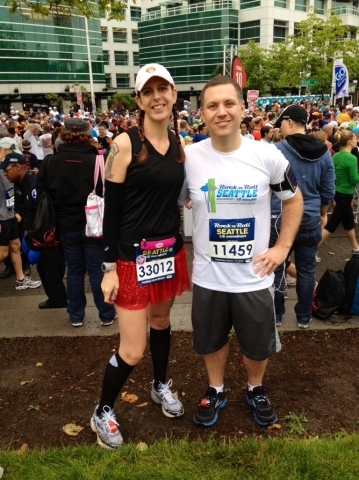 Seattle Rock-n-Roll Half Marathon race report! What presented itself as a hugely stressful event ended up incredibly fun, yet unbelievably hard! I am I beyond happy I ran this race. Even though I am sitting here at my laptop with ice on my left knee, amazed how painful it is to even walk on. The morning of the race I woke up at 4:30 a.m., ate, got my stuff together, got dressed and stretched a little. My friend Kathleen picked me up and we caravaned downtown with our friends Sarah and her husband Andy. We dropped Kathleen's car off downtown and then hopped in to Sarah's car and she dropped Andy, Kathleen and me off a couple of blocks from the starting line. I was so stressed, worried that getting to the race would be an absolute nightmare, but it wasn't. With all of that travelling and car-hopping, we were at the start line just after 6:00. As we came in to the race area Kathleen and Andy stopped at the porta-potties and then we walked right up and saw our corrals, 11 and 12. I brought my bag to the gear check and then hit up the Brooks VIP porta-potties. I thought it was kind of cool I had my VIP sticker and I got some gum, tums and a gu out of the deal, but it wasn't that much better than the regular porta potties. I think I went at just the right time, though, because I was able to walk right in to a stall and when I came out there was already a long line. The regular porta-potties ended up with long lines, too. Walking back to corral 11, where I had left Kathleen and Andy, I ran in to Ray, who is a friend from my intervals class running his first half marathon. He had been nervous about the race and had an aggressive time goal. We thought it would be fun to run together, but didn't make any promises. We waited to see Kathleen and Andy again, as Ray and Kathleen are good friends and had done many long runs together, but unfortunately we didn't see them again before the start. While we waited Ray told me his partner saw a water station filling cups with water from the fire hydrants and I kind of freaked out. I started remembering the scary stories of people getting sick at the Las Vegas Rock-n-Roll and many thought it was because of the fire hydrant water. I decided I didn't want to take the water, but I really didn't have a choice. We stood in corral 11 waiting for the start as the corrals were getting let out about a minute apart. Once the first corral had taken off I removed my throwaway sweatshirt and set it on the fence. Luckily the weather, which was threatening rain at any moment, was dry and cool. Right before it was our turn I saw my other friend Stacey and was so happy to get to say "hi" and "good luck" before we took off. Our corral left the start line at 7:12. Ray and I had discussed running the half in 1:55, which was pretty aggressive for both of us. I only had one half under my belt, which I ran in 1:57:59, and Ray was a newbie. We knew the course was hilly, but it was difficult to truly comprehend how it would affect our race. Luckily I had my pace chart from Taz Running for a 1:55 finish taped to the back of my bib and referred to it religiously, keeping Ray and I on pace the whole time. Ray and I, so very, very naive at the start of the race. Ray and I ended up running together the entire way, so when I say "we" below, that is referring to him. I was ready for the race to be extremely crowded, but it wasn't. Yes, there were a lot of us on the road, but I never felt like I couldn't hit my pace goal or that the crowds were keeping me from moving. We really picked up the pace as we hit Pioneer Square, knowing that we would need that buffer for the hills . . . . those effing hills! We were cruising down 2nd Ave at a decent clip and it was fun to see a few blog friends on the course and say "hi." We hit the turn on to Dearborn at the start of mile 2 and I felt the road heading slightly uphill. At the end of mile 2 we turned south on to Rainier and saw Ray's partner standing at the end of the water station. We waved and said "hi" before continuing on. I don't know why we slowed down here so much, I guess the road was more than "slightly" uphill. We cruised down Rainier at a decent clip. This mile really blended in to mile 4-5 for me. Rainier was a long, straight stretch. My very favorite part of mile 4 was the cheerleading squad. They had a cheer that said something like "runners, go that way!" as they did choreographed moves and pointed down the street. It was hysterical. We also saw our friend, Sarah, the one who dropped us off earlier in the day. It was so nice to see another friendly face on the side cheering us on. I took my first gel right before the water station at the end of mile 4. The first hill. We were prepared for this one and cheered each other on, offering lots of "you got this" and "doing great" and whatnot. Ray and I had done a lot of hill repeats in intervals class and knew we were prepared for the challenge. Matt and the girls were stationed at the top of the hill to cheer us on, and I think that really helped me power through it knowing they were up there. Once we got to the top and said "hi" and got our high-fives, we got to sort of cruise down the other side. It was so steep that it was hard to really let myself take off. I kept saying to Ray "be careful! don't trip!" Ha, such a mom! Here is a video my 8 year old captured of Ray and I hitting the top of the Dakota hill. At the end of mile 5 we rounded the turn on to Lake Washington Blvd. There were lots of people cheering on the turns from the backside of the Dakota hill down to the Lake Washington Blvd, so it was hard to know where to look to soak it all in. I can't figure out why this mile was so slow. Maybe we were really starting to feel it... plus the course narrowed here. It was the first time I felt like I had to weave through a lot of people and work to stay next to Ray. We were on one lane of a narrow two lane road. It was beautiful running along Lake Washington, though, and the flags, pictures and group from Run to Remember made it a memorable stretch. The clouds were starting to break and the sun was peeking through, which actually wasn't a good sign. It needed to stay overcast-- but not rain. Even though it had a lovely view, I kind of hated this stretch. At the beginning of mile 7 we were basically forced in to an almost single-file line to get up in to the I-90 tunnel, which slowed us down. Once we got to the top we ran through the dark and stuffy tunnel. I thought it would be a cool experience to run through the tunnel, but no. It wasn't cool. At all. Inside the tunnel was another water station, and if I recall correctly, another band. We came out of the tunnel at the end of mile 8. Heading out of the tunnel and in to fresh air. Ahhhh. I was definitely starting to hurt here. It was fun to run on the express lane, though, and lots of cars on I-90 were honking as they drove by. Ray and I weren't speaking as much at this point, but we were doing okay. It was nice to be out of the tunnel and back in to the fresh air. A low group of clouds hung over the city, blanketing the tallest buildings, so it was a beautiful view from up on I-90. We started heading down hill at the end of mile 8. My right side began threatening to give me a cramp and I took deep breaths and shook out my arms. Luckily I never got a full on cramp. I remembered this being a lot of downhill, but it looks like we went back up a ramp right at the end. I took my second gel here, and I had to stop to choke it all down. Ray kept running and I sprinted to catch back up to him. Ouch. I am glad I did, though, I was starting to desperately need his company and encouragement. We got our groove back as we went back through this stretch, turning south on 1st Ave and making a hairpin turn and going back north again. It was also slightly downhill or flat the whole mile until we hit the viaduct on-ramp at the end. It was nice to have the break before the hill that almost killed us . . . I don't remember exactly where it was, somewhere around the beginning of mile 10 maybe, that Ray and I decided we would cross the finish line together. Every once in a while during the second half of the race he would really pick up the pace and start pulling ahead and I would say "you are running really fast, go on ahead if you want to" and he would say no, and slow down a bit. I wanted so badly to pick it up to his pace, but I couldn't. I do not know how we pulled off an 8:44 here. The viaduct on-ramp almost killed us. We were in pain. It sucked. I spewed a string of expletives and contemplated telling Ray to just leave me there to die. It was beyond hard. I keep looking at the elevation map from my Garmin and it doesn't even look that bad, but it felt like torture. When we got to the top of the ramp we saw that the viaduct had a camber, which made the road difficult to run on. I stuck to the track in the road where the tires had worn down the pebbles in the cement. At this point I started counting my steps "1, 2, 3, 1, 2, 3" I kept looking at my watch, counting down the minutes. I knew for sure we were on our goal pace so I knew exactly how many minutes until the finish line. I thought running on the viaduct would be incredibly novel, but I don't remember looking out at the view even once. I looked up at the spectators cheering from the Pike Place Market, but besides that, I only looked ahead and at my feet. My Garmin elevation map shows the viaduct being another hill. I can't believe I was oblivious to it at the time. It was just 1, 2, 3. That's how you finish a half marathon, people. Three steps at a time. We went through the Battery Street tunnel and again I cursed the camber of the road, which was going the opposite direction of the viaduct. I didn't want to keep moving. I don't even know how I did. We came out on to Aurora, apparently went downhill (again, didn't really notice) and took a sharp left turn after the off ramp to Mercer St. I looked up, and, lo and behold, another ^%#&ing hill! Ray is awesome at giving it a final kick and he busted one out up that hill as we approached the finish line. I gave it all I had to weave through the runners after him. We had to cross the finish line together! 13.1 came and went on my Garmin. Crap. The finish line was still in front of us! Ray and I crossed together and then I basically saw stars. I bet if you looked closely at me, there were cartoon birds tweeting in a circle around my head. EDITED TO ADD: Here is a Seattle Times video that caught Ray and I crossing the finish line! Check for the stars and birds over my head! You can see us at :40. Look for my red skirt/black shirt, I make a beeline to the left of the frame as soon as I cross and Ray is on the right in his white shirt. Ray and I got our medals, high-fived, grabbed drinks and then he called his partner, who wasn't able to come in to the finishers' chute. Ray left to find him and thought he would be able to come back and wait with me for Kathleen to come through. I waited, saw some more blogging friends, and then Kathleen crossed the finish line. So proud of her, she finished her first half marathon! As we were contemplating leaving, Stacey came through and it was so amazing to see her as well. I made both of them take pictures with me in front of the R-n-R backdrops and we all made our way through the finishers' chute. I grabbed every food and drink offered, cradling piles of snacks like I hadn't had a meal in weeks. It was heavenly. I said goodbye to Stacey and made plans to meet Kathleen and her kids near the fountain before heading off to get my bag from gear check. When I grabbed my phone out of my bag (I know, I know, you're not supposed to do that, but the bag area was pretty darn secure) and found a text from my running bestie. She had been tracking my race online and knew my official time. So fun. I texted with her and made my way back to find Kathleen, her kids, and Andy. As we were making our way out I ran in to my friend Jen and grabbed a photo with her. She also ran her first half marathon! Jen and I after the race. Kathleen, her girls, Andy and I made our way back through the crowd to the monorail, hopped right on and rode downtown so we could get back to Kathleen's car and head home. I was seriously impressed with every aspect of the organization for this race. Everything seemed totally flawless, from getting to the race, to using the potties (at least, it was easier the earlier you used them), gear check, getting in our corrals, sending our corrals off, not being too terribly crowded on the course, plenty of water stations, the bands, the cool medals, the food at the end . . . . it was great. I could have done without so many hills, but this is Seattle. I think it would be pretty much impossible to run 13.1 miles without hitting a hill. I prepared myself for a nightmare so I was incredibly surprised. I also ran the race without my ipod, which is something I have been trying out. I run about half my training runs without it and my last race, my 15K, I ran without it. I didn't miss it on the 15K and honestly, I never once wished I had it at R-n-R. I had Ray, and even without Ray, my ipod wouldn't have given me any motivation on the course. I was totally fine not having it on such a big and busy race. Can't wait to do this one again next year. My friend Tara said she has a dream of running the Portland AND Seattle R-n-R so she can get a cool Pacific Peaks medal for doing both. I think that sounds like a great idea! Great race, Sybil! Sarah & I actually saw you (we were cheering at the point where the half & full runners split) but you were past so FAST that we didn't have a chance to get your attention! Way to go! @Laura, was trying to run a negative split, I couldn't quite figure out if I pulled it off! @Tiffany, aha! I didn't imagine it then! Awesome time and that is pretty cool you got on the news :). Glad to have a new blogger to follow! Wow great finish on the half! Definitely not an easy course. I ran the full marathon that day too. Great job. I did PDX and SEA and thought PDX was harder. Girl you totally rocked Seattle!!! It was so great meeting you! Nice job and great recap!